When we look at the crypto marketplace throughout the last couple of years, we’ll notice the space was populated by quite a few scam projects. Bitconnect, Davos, Onecoin are probably the ones that come to mind to most crypto enthusiasts when thinking about this subject. Still, there were many more projects that didn’t gain that much mainstream attention and simply slipped through the cracks of the public scrutiny. Today we will be taking a closer look at one such project named MCAP coin. The currency was created by brothers Amit and Vivek Bhardwaj, famous for creating and running several crypto related ventures like GBMiners, HighKart, GainBitcoin, GB21 and BitcoinGrowthFund. The Bhardwaj brothers were among the first and biggest Indian cryptocurrency miners, said to have controlled around 3% of BTC’s hash power at one time. The brothers (Amin in particular) were also pretty good at marketing and advertising, in part thanks to their close relationship with several well-known individuals from the Indian Bolywood. Using his connections, Amit Bhardwaj got the Indian showbiz stars like Shilpa Shetty, Neha Dhupia and Huma Qureshi to endorse his book, Cryptocurrency for Beginners. Bitstamp is one of the oldest cryptocurrency exchanges. Read our Bitstamp guide here. This helped him gain recognition and trust from retail investors who eventually fell for a number of his multi-level marketing (MLM) schemes. Officials told India Today that the amount of money these two scammed out of people with their projects could be anywhere between ₹5,000 crores and ₹13,000 crores ($730 million – $1,8 billion USD). MCAP project was just one of his MLM schemes which ultimately stole around ₹2000 crore ($300 million USD) from the pockets of its investors. MCAP was supposed to be a key part of the BitcoinGrowthFund/GainBitcoin ventures. Users were given an option to purchase MCAP tokens with Bitcoin and then the BGF would invest said Bitcoin into various mining projects and ICOs. They claimed that they have developed an algorithm to calculate which altcoin would be most profitable to mine at any given moment based on its difficulty level, trading volume and the profit it would generate. The company immediately mentioned investing into “altcoins” such Bitcoin, Litecoin, Ethereum, Zcash, DashCoin and Monero (Bitcoin is clearly not an altcoin; their inability to make this simple distinction was one of many red flags that were available). They also claimed they have a dedicated team of analysts which would continuously analyze the ICOs available on the market based on more than thirty parameters such as background of the team, viability and scope of the product idea. Also, the GainBitcoin platform was apparently a cloud mining start-up which had a similar business model which lured investors in by asking them to invest their BTC and promising monthly returns of 10% across 18 months from the day of their investment. The team behind the token claimed how “strongly believe” that MCAP tokens will see an increase of around 1000% within a year of their launch. The token was launched in late April of 2017 with a price of $15 USD (that was initially discounted to draw in more investors, a cheap tactic often used by scam projects). They claimed they would initially release 20% of the tokens total supply of 100 million MCAP’s and then distribute the rest in the “coming months”. Immediately the question of token economics comes to mind and makes us wonder: how will a currency that wants to quintuple its supply in under a year manage to achieve an increase in price of 1000% after that same time period? The red flags kept piling on from there. After raising over $19 million USD (!) with their ICO, they published an update on their Medium blog page. The update was very vague, citing how the funds collected from the sale of MCAP tokens will be spent. They even added some hilarious quotes from people they literally signed as “Crypto Analyst” and “German Hedge Fund Manager” (because Germans are calm, collected and efficient and know their way with money, right?!). The “efficient German” trope is rather generously used in scams we see pulled off in various third world countries. Still, these were the golden ages of crypto revolution when you could have slapped a Bitcoin sticker on a rotten apple and it would have people offering you wads of cash for it. Bitcoin-based MLM’s were especially popular at the time and MCAP certainly didn’t fall behind. The modus operandi of the average MLM involves people investing money and receiving guaranteed payoffs in the future. Bhardwaj brothers schemes promised to make these payoffs in Bitcoin. GBMiners, GainBitcoin and the rest of the ventures did so in the beginning. However, the terms and conditions of these ventures were soon rewritten and they started paying out people in MCAP tokens. “According to the original contract, payouts were 100% BTC payouts for 10% of the investment every month. The first change to the payouts was 50% BTC and 50% MCAP token (to be introduced then) payouts. The second change to the payouts was 100% BTC or MCAP token payouts at the discretion of investor and payout would be on daily basis than after 15 days (as it was) earlier,” said a disgruntled investor for factordaily.com. Most investors were fine with this, until they realized they have almost no way of liquidating these into Bitcoin/fiat. The platform had its own built-in exchange but this exchange accepted sell orders of only 5-15 MCAP tokens. Hundreds, if not thousands unfilled sell orders for 15 MCAP tokens soon flooded the order books of this platform because the exchange soon ran out of BTC to compensate the traders with. “On mcap.exchange, even if you place the sell order, the message that was shown was that the exchange has 0 BTC as balance to pay for the MCAP tokens being sold; so, try again later,” were the words of another investor. The other option was to sell your tokens on one of the exchanges that traded the token. The only issue here was that the price on these exchanges was 10 times lower than the price of 0.00215 BTC that was fixed on the mcap.exchange. This massive price discrepancy can explain the wild movements noticed on the coin’s graph over time. Things soon started falling apart. The community started going after the brothers and their ventures on social media, calling them out as scams. Amit started a similar Ethereum mining venture which was greeted with vitriol and abuse from people who were waiting for payments from GainBitcoin and BGF. 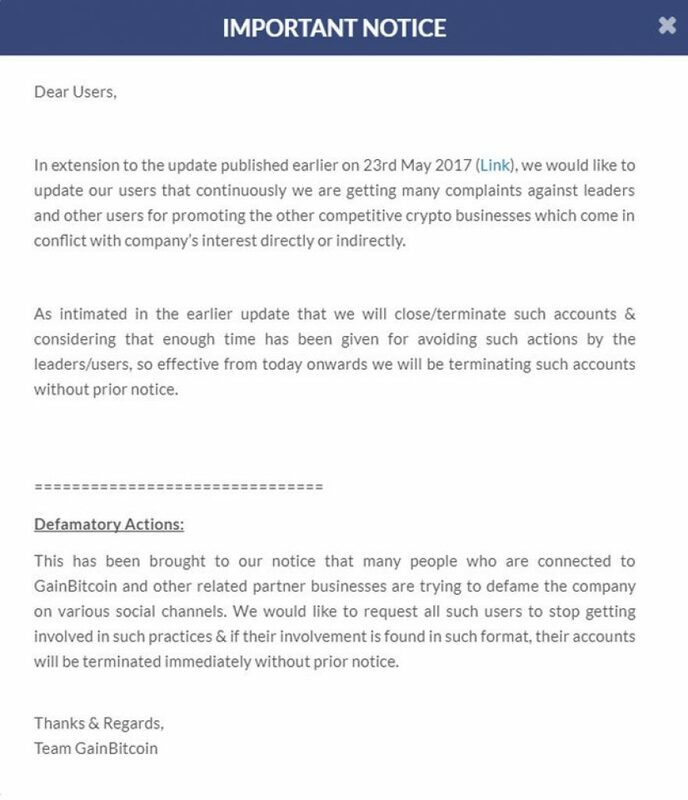 In response, GainBitcoin released a statement saying that people who are caught spreading “defamatory actions” against the venture will have their accounts terminated for good. Surprisingly enough, this didn’t sit well with the investors. People started attending their MLM-promoting seminars (these types of Tupperware-like scams and projects are rampant in India and other poor countries) and calling the company people out. “The moment users raise concerns or ask uncomfortable questions their mics are muted off or they are kicked out of the webinar,” said one of the former investors who attempted to confront the promotors. 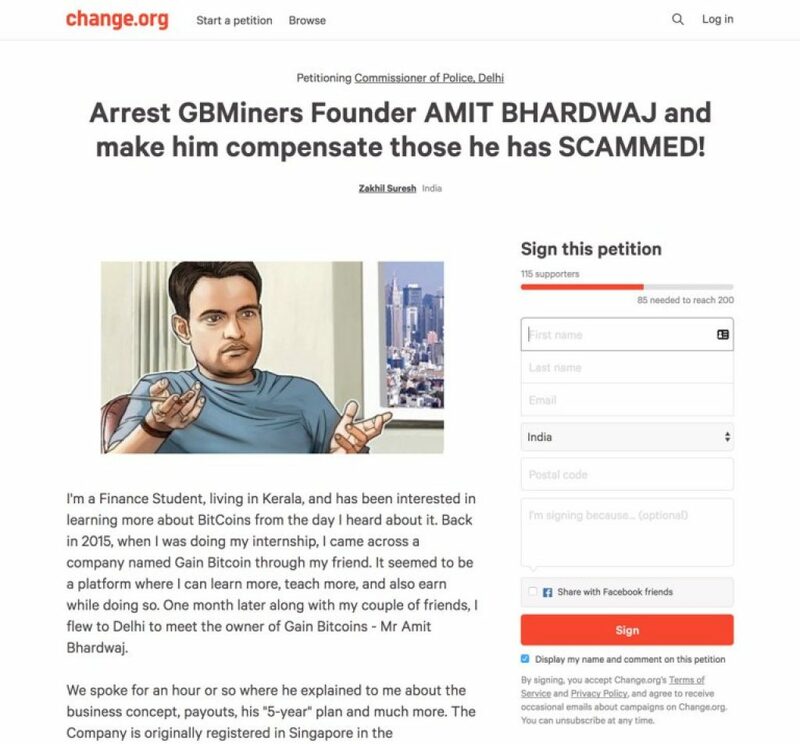 The pressure only kept rising from here, as people started a change.org petition to arrest Bhardwaj and deal with his fraudulent behavior. Others went about and submitted actual legal requests to have the ventures investigated. Some even went as far to threaten the brother’s lives, and the danger was so real that they moved out of India in the closing days of their “careers”. Soon enough the entire story turned into a Bollywood version of the “Catch me if you can” movie. 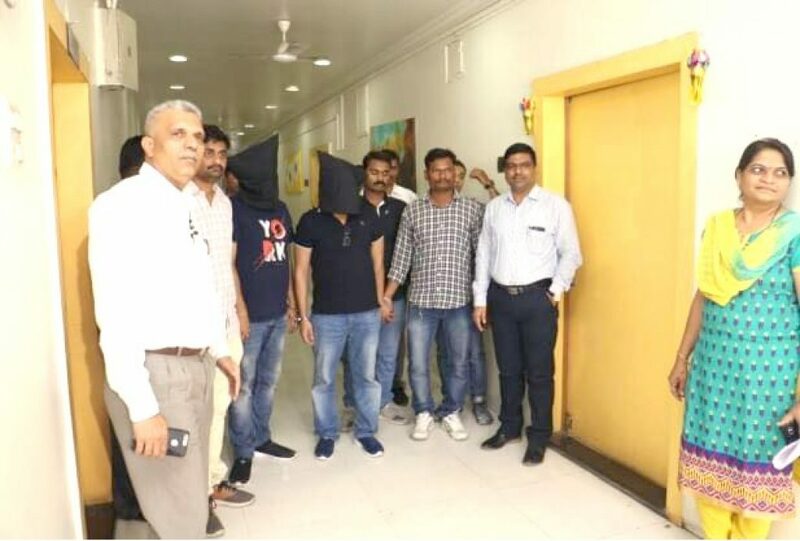 The brothers went on a run as an arrest warrant for them was issued by several cooperating agencies, including India’s central bank Reserve Bank of India (RBI), the Enforcement Directorate (ED), and the Cybercrime Cell of Pune Police. The warrant was initiated following an official complaint filed by a businessman Parvendra Singh, who also fell victim to the brothers’ schemes. The brothers were caught twice – first time in Dubai, Amit faked a heart attack and this somehow gave the brothers time and space to evade their captors. The second time the officers weren’t as lenient; the brothers were apprehended in Thailand in April of 2018 and extradited back to their home country for trial. The schemes started by the brothers have caused much outcry, especially on social media, over the years. India and many other poor countries are a fertile ground for scams and “get rich quickly” schemes but even so, it’s impressive to look at the full scope of what the Bhardwaj family and their associates managed to achieve. The full scope of their activity is yet to be established; a 4000 page charge sheet was filed just against the 9 people that ran the GainBitcoin project. Naturally, the MCAP token is as dead as a dodo. It’s easy to be a “smart investor general after the scam battle” but the fact is that the warning signs about this one and similar projects (BCC, Davos) have been out in the open way before the shizzle hit the fannizle. Had investors done proper due diligence on the people behind these ventures and the ventures themselves, most of these losses could have been avoided. Scams will always exist, but it’s important that people educate themselves and learn how to avoid falling victims to them. Previous articleEthereum Plunged 15% Today to $305, What Will Happen to Alts and Tokens?